Our Modern Shaker Chest of Drawers will bring a timeless style into your bedroom. 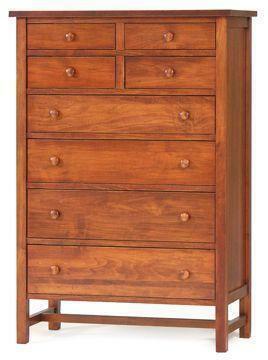 This hardwood chest of drawers has 8 drawers offering plenty of storage space for your clothes and linens. The clean lines of this Amish bedroom furniture will complement any decor style. We offer a wide variety of styles of chest of drawers as well as other bedroom furniture items. Please call to speak to an Amish furniture specialist with questions or ordering assistance on our maple wood chest of drawers. Please allow 6 to 12 weeks for this furniture item to be built.